After a long wait, Jeep is finally about to bring in the Compass to India. We recently got our hands on the Compass in sunny Goa and came back mightily impressed. 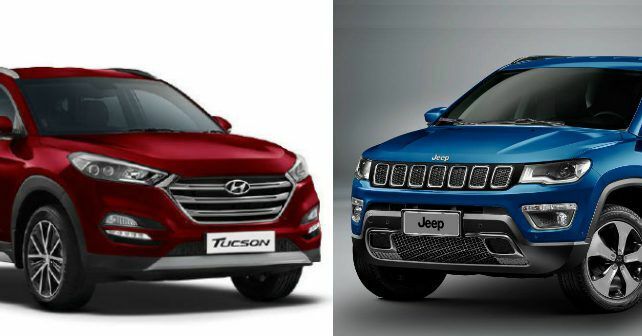 If priced in the Rs 18-23 lakh range, the Jeep Compass will fall in exactly the same price bracket as the Hyundai Tucson. Let’s take a look at the specs, features and other details to find out how they stack up against each other. The Jeep Compass will be offered with petrol as well as diesel engine options. The petrol-powered Compass comes with a 1.4-litre MultiAir Turbocharged motor that produces 160bhp and 250Nm. This engine will come mated to a seven-speed automatic transmission or a six-speed manual transmission. The diesel, on the other hand, will come with a 2.0-litre MultiJet motor that is good for 170bhp and 350Nm. At the time of the launch, the oil burner will only come paired with a 6-speed manual. The diesel version with the manual transmission will come with a 4x4 drive system. The Hyundai Tucson comes with petrol and diesel engine variants, both of which are 2.0-litre engines. The Tucson pulls out 153bhp and 192Nm from the petrol motor. The diesel produces 182bhp and 400Nm. Unlike the Jeep, the petrol, as well as diesel engine variants of the Tucson, come with manual and automatic gearbox options. That being said, the Hyundai Tucson doesn’t come with a 4x4 option. Of the long feature list that both these cars come with, the Compass has the advantage of the being fitted with Jeep Active Drive System thanks to which it can take the road unexplored. The compass comes with four driving modes – Auto, Snow, Sand, and Mud. Both cars get ABS and front airbags as standard. Other standard features include touchscreen infotainment with Bluetooth, AUX and USB compatibility. The top-spec variants of both cars get traction control and hill start assist. The Jeep Compass misses out on features like Cruise control and automatic headlamps. Meanwhile, the Tucson doesn’t get ISOFIX and three-point seat belt for the third passenger at the back. The Hyundai Tucson starts at Rs 19 lakhs for the base petrol manual and goes right up to Rs 25.01 lakhs for the top-spec diesel automatic. Jeep hasn’t launched the Compass yet but we expect it to be priced somewhat similarly. That being said, dealerships are currently weighing customer response towards a price range of Rs 20-28 lakh. At that price, the Compass is likely to find it difficult to justify the price tag especially knowing that you can get the Ford Endeavour 2.2 MT, petrol or diesel option of the Toyota Fortuner or even the base Comfortline trim of the Volkswagen Tiguan.